Happy Holidays from Rachel Vincent! My husband and I make a gingerbread house, open presents in front of the tree, and make Christmas dinner. Anything that’s frivolous, fun, and unexpected. Homemade chocolate chip cookies, straight out of the oven. And homemade apple pie. I only make it on holidays. * Want to win cool stuff from Rachel Vincent? Sign up for her quarterly newsletter to get all the details. * Jeaniene Frost guest blogging about plotting or pantsing. * Charlaine Harris answers questions at SciFiWire. I was sure vampires would be fun to write, and I wanted to take a direction that was new and fresh. (At the time, it was!) I decided to be the anti-Anne Rice. (This is not a knock on her work, but an attitude.) Since she took romantic southern Louisiana, I’d take the northern part, which is much more prosaic. Since her vampires were romantic and pay a lot of attention to their clothes, mine would shop at the mall and have ordinary names. That can only go so far; after all, I had no intention of writing a parody or of mocking her work, which I admire. After deciding your style of writing for the work you want to do, you have to construct a credible world. * Chris Howard has created a graphic prequel, Saltwater Witch. The events of the story take place 5 years before those in his novel Seaborn. 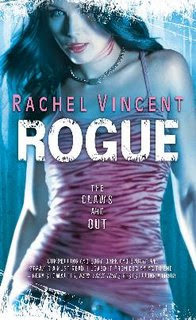 Rachel Vincent’s Prey, the fourth novel in the Werecats series, will hit the shelves July 1, 2009. Someone’s been killing stray werecats, and during the course of the investigation, Faythe Sanders and Marc (her lover, investigative partner, and her father’s chief enforcer) stumble onto serial kidnappings. Someone’s been taking strippers in the same towns 24-hours before strays show up dead. Who’s doing the kidnapping? Who’s doing the killing? When Faythe seems to be connected to it all, will her relationship with Marc survive? Rachel Vincent finished the revisions for Prey, which is enough awesomeness on its own, but then Vicki Pettersson compared and contrasted their working methods, specifically the notecards and took awesomeness to a whole new level. Abby Ranger and David Levithan at Scholastic prevailed in a multiple-round auction for world rights to Maggie Stiefvater’s Shiver in a two-book deal with Laura Rennert at Andrea Brown. This YA novel describes the first love between a 16-year-old girl and a mysterious boy who spends his winters as a wolf and is fighting to stay human as the temperature drops. The 26-year-old Stiefvater has a YA novel, Lament, just out from Flux, with a sequel to follow. Shiver will be published in fall 2009. Anton Strout announced the winners of the Dead to Me photo contest. Io9 hooks you up with a Vampire Dating Service. Jeaniene Frost fans have much to cheer: 4 more books and an anthology spot! “Rogue” follows the life of Faythe Sanders after she has returned to her Pride in Texas. Her stay is involuntary, being forced by her father to serve her Pride for three years before she could earn her freedom. However she does feel the perks of it working as the only female enforcer ever, monitoring the borders and getting rid off stray cats, who have no business in her Pride’s territory. Everything starts off blissfully enough. Faythe is content with her life and relationship with Marc, her long time lover, but when a series of murdered tom cats start appearing out of nowhere every second matters and peace is a very abstract and far away concept. Parallel to this unnerving commotion in the werecat community, humanity takes notice of a strand of missing stripers. The disappearances overlap with the locations the dead toms were found and a frightening pattern is established. There are two criminals on the loose and one is after the other.